This tropical ficus tree is only two years old. It was purchased from a retail nursery center. After training it in a plastic pot by pruning leaves and branches for several months indoors, we root-pruned and put it into a ceramic bonsai pot. Bonsai wires were wound around the limbs and the limbs carefully bent to create a nice shape. Create a finished looking tree before transferring to the finished ceramic pot. For a larger tree, with a more mature trunk, "pot up" for a few years giving plenty of soil for growing an expanded root system and shape-prune the tree along the way before root-pruning and planting. The Ficus tree is 8" tall and will be kept this height by pruning any roaming branches that would change its basic shape and size. As it fills out, large leaves will periodically be removed - either clipped middle way on the stem or pinched off. Ficus trees like bright light from north facing windows (not direct sun). OK outside in shade or on porches when over 50 degrees. Use an organic spray over and under leaves for protection against bugs especially in warm months outside. Dwarf Juniper Juniperus chinensis procumbens "Nana"
This 6" Juniper was purchased from a bonsai nursery as a pre-bonsai at three years old; limbs, needles, and roots were pruned, and the tree was potted right away. Beneath the foliage, it had a natural bonsai shape so no wires were used. This small bonsai needs protection from winter cold and winds. We have mulched it right into a bed amongst larger plants for three winters now. 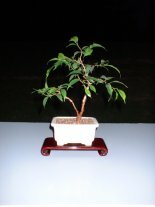 Usually, glazed pots are used for indoor trees and colorful deciduous trees; unglazed pots are used for outdoor bonsai. The container choice is made with care for the size of the tree's root system and to choose a vessel that compliments the character of the tree. 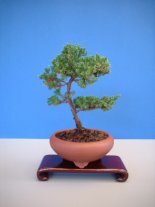 We feed our small bonsais with 1/4 strength of an all purpose (7-9-5) liquid fertilizer with every watering, except for outdoor plants in winter dormancy. In spring, we use a special "bloom" (3-12-6) liquid fertilizer for anything that blooms. Mix by the gallon for convenience. Healthier plants have stronger defenses against bugs and diseases. Try to group plants as to watering needs for ease and practicality. Humidity trays and automatic watering systems take care of vacation time. Cooler temperatures and slower-draining soils= less water. A fast-draining soil, however, helps grow a bonsai by allowing small, fibrous root systems to develop. Add sterile, course (not beach) sand to a good humus (mulch) to the degree that suits you. Sand provides good soil aeration. Small root systems will develop best in aeration spaces around the irregularly shaped grains of sand. "Tropical" bonsais need to live indoors unless your temperatures are in a season staying above 50 degrees. Simulate a tropical atmosphere with grow- lights in a storage room or closet and mist plants occasionally. Window light without direct sun will be best. Glass magnifies sunrays. All other trees - deciduous and evergreens - are kept in their natural outdoor temperatures which provide dormancy in winter. Trees that need to experience the four seasons can have an occasional display visit indoors with careful attention to water needs as heat/air conditioning can dry the soil quickly. Open porches lend flexibility although most outdoor trees appreciate sun and rain with some protection from the elements according to placement of tree, size of container, and your particular tree and climate zone. See "Plant List & Climate." Bougainvillea Glabra, a tropical tree. We started as a bonsai in early 2002. Photo 5/02. This flowering tropical produces flowers best when growing outside. In non-tropical zones, over-winter plant in 50+ degrees.